Revitalize and Volumize with Hyla3D HA Activating Complex. Take a 3-dimensional approach to restore skin’s hydration and youthful volume. Age and sun damage diminish the body’s ability to produce and maintain youthful levels of Hyaluronic Acid (HA) in the skin; leading to loss of volume and visible signs of aging. 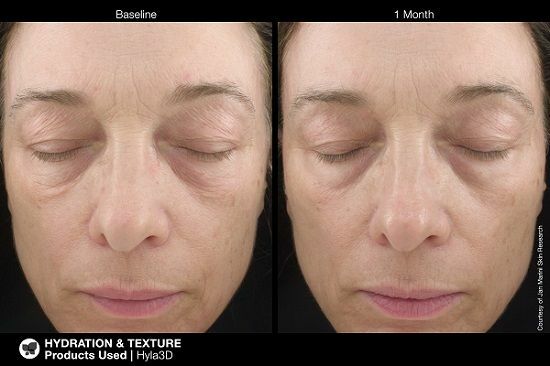 Hyla3D takes a 3-Dimensional approach to restoring HA and volume to the skin. 1. Multiple forms of HA apply deep, long-lasting hydration. 2. Advanced technologies enhance HA within the skin. 3. Peptides and antioxidants boost collagen and elastin. 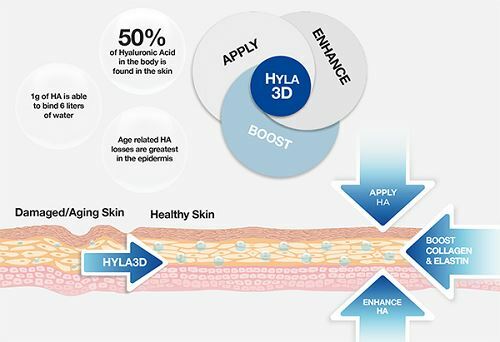 Hyla3D restores hydration while reducing the appearance of fi ne lines and wrinkles for a more youthful, contoured look. Can be used all over the face or on targeted areas. Shake well before using. Prior to use, leave plastic lid in place, invert and tap the top of the container several times into the palm of your hand. If you experience diffi culty when dispensing, repeat and pump product into the hand while inverted. Apply sparingly in the morning and evening over entire face and neck. Water/Aqua/Eau, Glycerin, Butylene Glycol, Sodium Hyaluronate, Acrylates/C10-30 Alkyl Acrylate Crosspolymer, Sodium Hyaluronate Crosspolymer, Saccharomyces Lysate Extract, Oligopeptide-24, Ubiquinone, Calcium Ketogluconate, Peucedanum Graveolens (Dill) Extract, Panthenol, Lecithin, Hydrogenated Lecithin, Tocopherol, Dimethicone/Vinyl Dimethicone Crosspolymer, Xanthan Gum, Caprylic/Capric Triglyceride, Glycine Soja (Soybean) Oil, Sodium Hydroxide, Potassium Phosphate, Pentylene Glycol, Ethylhexylglycerin, Caprylyl Glycol, Sodium Oleate, Citric Acid, Isoceteth-10, Silica, Lactobacillus Ferment, Alcohol, Hexylene Glycol, Disodium EDTA, Phenoxyethanol Patent Pending.